In the past couple of days I got to play tug-o'-war with a striped bass (he won), watch a loon chase spearing, and listen to the fog horn go on for hours--it is spring in Cape May. Last night my brother surprised me with a few gifts. I slipped past fifty when I wasn't looking. 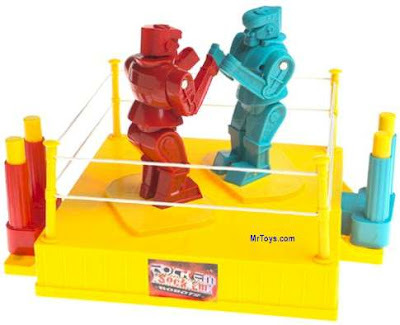 Rock'Em Sock'Em Robots. Labyrinth. A 007 spy camera/gun. A 1959 World Almanac. A classic rod hockey game (nobody ever beat me). A Tinkertoy set. Joe Pepitone, Jerry Koosman, and Tug McGraw baseball cards. None of it expected, none of it deserved, all of it cherished. This morning I built a cabin out of Lincoln logs. The container has both a girl and a boy (the boy with an odd expression on his face). Some of the pieces have been chewed on by a puppy who has long died of old age. My Lincoln logs are made of wood. Some fit together better than others. Every single piece came from a tree, and had to be shaped. I built a small cabin with a window and a door. I forgot to put in a log. I had to take apart a wall, and when I did, it fell down. No reset button. Just Newtonian physics. A little bit of frustration. I rebuilt my cabin. A lot of satisfaction. Plastics are cheap, and easily shaped. (That's why they're called plastics.) Plastikos: moldable. About a century ago we figured out how to mold oil. Ben, I got to talk to you. I'm just going to say one word to you. Very low doses of bisphenol A, found in many plastics, prevents chromosomes from lining up right in rats. It has been associated with breast cancer. It has been associated with prostate disease. BPA mimics estrogen. A year or two this made big news because you can find it in baby bottles. But we knew that already. And we did it anyway. My daughter loves to fish, but will only fish for what she can eat. She lives in New Jersey. This means she can no longer fish for bluefish. Or striped bass. Or eel. Or white perch. She can eat one fluke a month, and one weakfish. We'll catch our fluke in June, our weakfish in July. I'm not supposed to eat bluefish more than 6 pounds. I'm already addled. I'm no longer reproducing. I'm eating bluefish. My grandfather was born in 1898. He could eat all the bluefish he wanted. He lived a long life, and finally died in the 1990's. He worked until a a couple of weeks before he died. He never drank water from a Nalgene bottle, and if he ever had the opportunity to drink from Nalgene, water would not have been his first choice. Plastics were not invented until he was 11 years old. Toys were made out of wood because that was what was available. Wood is still available. Plastic is cheaper. Imagine if the Soviet Union sold us baby bottles that harmed out children. Don't worry, it's Dow, GE Plastics, and Sunoco, not the Commies. BPA was developed in the 1930s, specically as a syntheitc estrogen. Now the States make over 2 billion poinds a year of this stuff. An estrogen mimic acts like estrogen. Wowzers, stop the presses! I am a science teacher--hundreds of children have passed through my classes, and I bet not one of them worries about BPA. Lincoln logs did not contain BPA in the 1960s--they were made of wood. In the 1970's, plastic replaced the wood because, of course, plastic is cheaper, and in our culture cheaper trumps just about everything. Lincoln logs are wood again. The fish are still not safe, but at least a few people are aware of the problem. So this summer my daughter and I will catch a fluke or two, then maybe play Skeeball to replace fishing. Should either of my children choose to have children, they will know what wood feels like. Your comments on plastics remind me of the work "Boys Adrift" by Leonard Sax. He quotes some interesting research about plastics and the estrogen link. I have a slidecast of the book if you are interested. btw congrats on the birthday. I would be very interested in the slidecast. My sister was an outstanding environmental advocate, and told me years ago (before she died) about much of the stuff that is now getting press. I was a practicing pediatrician at the time, and knew little about it. The sad thing is that much of the information we have does not change behavior. And thanks--the older I get, the less sense anything makes, and the more I appreciate it. Those are fantastic birthday presents - your brother was good to you! It's hard to find those favorite toys in their original materials. Enjoy! So many chemicals and so much disinformation and lack of awareness. As a Chemist, it boggles my mind what we have done to the soup in which we live. They have told women who live near the Arctic not to breastfeed their children because the carcinogen level is too high - something about how the earth's revolutions concentrate toxins at the poles. :( It all seemed like a good idea at the time. These are some of my favorite toys, and they are some of my daughters' as well. They feel good in your hands. The metal pieces of the erector set make your hands smell like machine oil. It's great. We have had our share of plastic toys as well, but the ones that are still around, the ones that they want to hold on to at 15 and 12 - are these. It snowed today. The sun took care of much of it by this afternoon, but it's a lot of snow. So much for that "in like a lion, out like a lamb" theory. Happy birthday. I turned 50 this past summer. I am much younger at 50 than women of my mother's generation; I suspect that even though you are eating that bluefish, you are younger at 50 as well. My sons' favorite toys are the oranges that fall off our tree and the branches they can manage to pull off. These become baseball games, dragons to destroy and eventually a chance to look at fruit flies. Sadly, many parents I know would freak out at their children being exposed to so many germs, but I secretly wonder if it's better for them than the plastic toys they own but rarely play with. Great post. I had most of those toys as well. Add in a metal erector set for good measure. My biggest plastic worry is all the added plastic packaging on tech toys. You know, a 5x7 inch plastic case for a 1 inch thumb drive that you need a wire cutter and work gloves to open. How about all the landfills of dead computers. Don;t even get me started on that one. I'm just catching up on your blog. My school blocked your site. Go figure. Great posts lately. Thanks.